Gerard Post Herrick was one of the earliest to advocate combining fixed-wing flight with rotary-wing flight, a concept he initially called the Vertoplane and which has subsequently become universally denoted as the "convertoplane." He has been given little notice by vertical flight historians, quite unjustifiably becoming one of the "forgotten rotary-wing" pioneers, the champion of a concept that even today in various forms seeks legitimacy. Gerard Post Herrick graduated from prestigious Princeton University with an A.B. at the age of 22 in 1895 and received his law degree two years later in 1897 from New York Law School. Interested in things mechanical, and keenly aware of the dawn of the age of manned flight with the Wright brothers, as information gradually became available of their 1903 flight, Herrick eventually committed himself to an aviation future in 1911 when he formed the Herrick Engine Company to promote his "balanced rotary engine" concept. 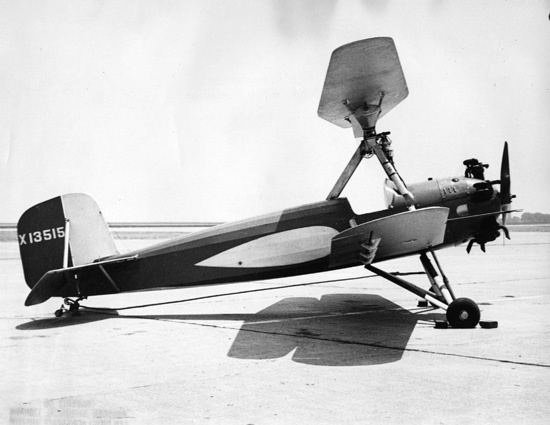 Herrick became interested in 1927 in the possibility of combining both fixed -wing and rotary-wing flight. Inspired by the early reports of the rotary-wing success of Juan de la Cierva, but rejecting Cierva's conceptualization of the "flapping hinged rotor", as he was already theorizing about combining rotary-wing flight and fixed-wing in a bi-plane arrangement where the upper wing would also become a rotor, Herrick developed the "symmetricallly cambered wing" that could produce lift while either fixed or rotating, and sought to combine this with the lower wing of a biplane that could either function in fixed or combination mode with the upper wing acting as a rotor. In World War-I he was Captain in the US Army Air Service and had served eleven years with Squadron A of the New York National Guard. More recently he was a member of the Committee on Universal Military Training headed by General Adler. Mr. Herrick was a member of : The Academy of Sciences, American Rocket Society, American Society of Mechanical Engineers, Army and Navy Club of Washington, D.C., Association of Ex-Members of Squadron A, New York City, Associate Member of Institute of the Aeronautical Sciences, Associate Member of Seventy Seventh Divisioin Association, Newcomen Society of North America, Princeton Club of New York City, Princeton Engineering Society, The Convertible Aircraft Pioneers, University Club of the City of New York, University Club of the City of New York, University Club of Winter Park, Fla., University Cottage Club of Princeton, N.J., and the Wings Club of N.Y.C. Gerard Post Herrick, President of the Convertoplane Corp., New York City, died at his home September 9, 1955. Mr Herrick was best known as an inventor and research engineer. Named the father of "Convertible Aircraft" at the first Convertible Aircraft Congress on December 9, 1949, sponsored by the Philadelphia sections of the Institute of the Aeronautical Sciences and the American Helicopter Society, he was awarded a plaque reading "in recognition of his inventing and building the first convertible aircraft, the CONVERTOPLANE, which was publicly demonstrated flying both as an aircraft with rotor wing fixed and as an autogyro with rotor wing rotating, at Niles, Michigan, Municipal Airport, November 6, 1931." The CONVERTOPLANE, which was publicly demonstrated at Boulevard Airport, Philadelphia, July 30, 1937, made its first conversion from fixed to rotating wing flight on that date. "Gerard Post Herrick (1873 - 1955) America's Unforgettable 'Forgotten' Convertiplane Pioneer", Dr. Bruce H. Charnov Ph.D, J.D., Presented at the American Helicopter Society 63nd Annual Forum, Virginia Beach, VA, May 1 – 3, 2006"